Economic expansion has been maintained through robust performance of automotive, aeronautics, chemicals and electronics industries and the tourism sector. The political situation is rather stable. King Mohammed VI holds most political power in his hands. There is no immediate threat to the monarchy and establishment as the King is popular with the people. However, social tensions have increased since 2017 due to lingering problems (high youth unemployment, income inequality and corruption) and have led to protests in the Northern part of the country. Nevertheless, widespread unrest is not expected in the short-term. Morocco remains vulnerable to the threat from Islamic extremism. In particular, Moroccan fighters returning from Libya and Syria are a concern for the authorities. However, the country has not been hit by major terrorist attacks over the past few years. Preserving security to avoid a negative impact on tourism is very high on the government´s agenda. 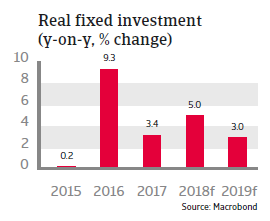 Morocco has made structural reforms to diversify its economy by developing industrial manufacturing, especially export-driven sectors (cars, aeronautics and electronics), and to provide a favourable investment environment (tax breaks have attracted many investors). 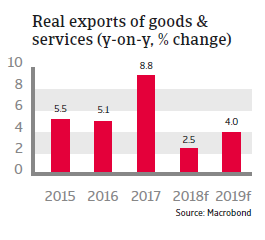 Low unit labour costs and a slightly undervalued currency enhance Morocco’s competitiveness. Since 2000, GDP per person has increased by 70% in real terms. However, despite those major progresses some weaknesses remain. The country remains highly dependent on agriculture, which employs about 40% of the workforce, and volatility in agricultural output has a major impact on private consumption and the economy. Tourism, automotive exports and remittances generate most foreign exchange income, but are highly dependent on the economic situation in Europe. Morocco is also vulnerable to rising oil prices, being a net oil importer. 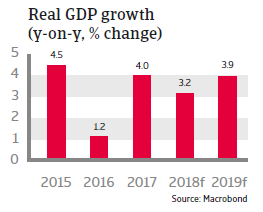 Finally, low levels of education, infrastructure shortcomings, corruption and labour market inefficiency remain obstacles, while competition from Asia limits future earnings capacity in the manufacturing sector. 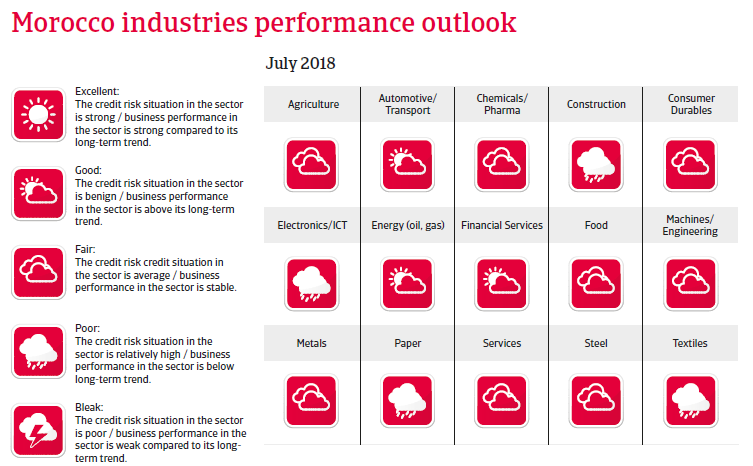 Economic growth is expected to decrease somewhat in 2018 as less favourable weather conditions affect agricultural output. However, economic expansion has been maintained through robust performance of the automotive, aeronautics, chemicals and electronics industries and the tourism sector. Inflation remains below 2%. The banking sector benefits from a strong regulation, with sufficient capital-adequacy ratios and liquidity levels. 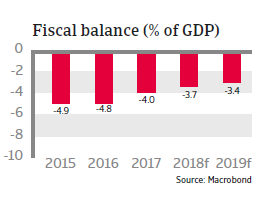 The fiscal deficit is expected to decrease to below 4% of GDP in 2018 and to decline further in the medium-term. That said, ongoing subsidies and infrastructure investment keep public expenditures high. Public debt is expected to stabilise at about 75% of GDP in the coming years, which is high compared to other emerging markets. However, the benign debt profile mitigates refinancing risks, as a large share of debt is domestically financed and average maturity has been extended to more than seven years. Morocco also retains good access to international capital markets. 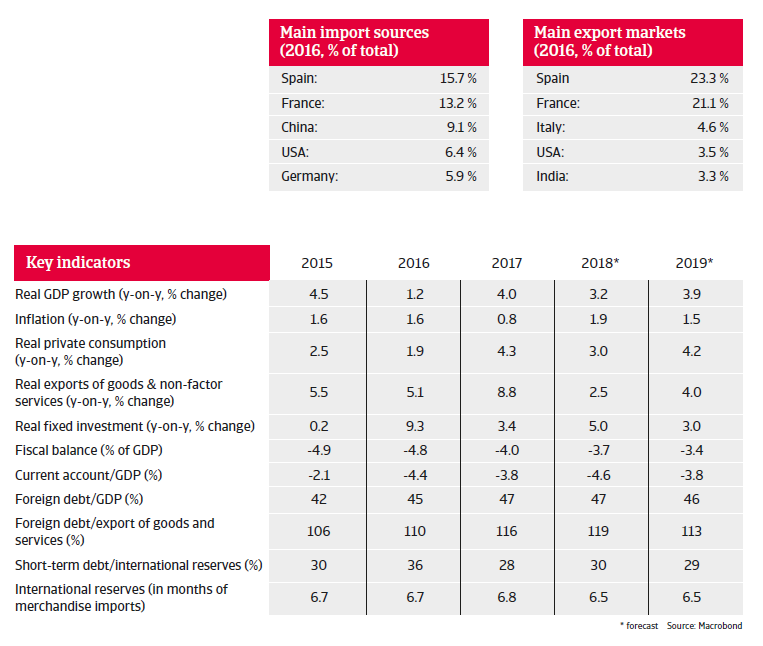 Morocco´s external position is acceptable with a current account deficit of about 4.5% of GDP and a reasonable external debt level (around 45% of GDP), while external financing needs are sufficiently covered by international reserves (more than six months of import cover in 2018). Although Morocco is moving to a more flexible exchange rate (the dinar is currently pegged to a basket of 60% EUR and 40% USD), this process is very gradual, which should imply limited currency risk. Morocco’s precautionary liquidity line with the IMF (on which it has not drawn) has expired, and a follow-up programme is still in discussion, as this would reassure investors.